CAMARILLO, Calif.--(BUSINESS WIRE)--Semtech Corporation (Nasdaq:SMTC), a leading supplier of high performance analog and mixed-signal semiconductors and advanced algorithms, announced that Transco Industries Inc., a leader in conveyor components, design, installation, maintenance, and repair, has implemented Semtech’s LoRa® devices and wireless radio frequency technology (LoRa Technology) into its conveyor belt applications for safer monitoring while reducing operating costs. According to market research, the global conveyor belt industry is expected to reach a value of US $6.4 billion in 2022 with smart belt technologies leading this growth. Transco’s LoRa-enabled sensors were developed to flexibly fit into existing mining infrastructure including conveyor belts. The small and durable sensors connect to private networks based on the LoRaWAN™ protocol allowing the continued relay of real-time data in the extreme conditions found in a mine. A miles-long conveyor belt is equipped with an end-to-end solution consisting of several sensors embedded in the belt itself to measure stress and prevent potential ripping. In the event of a belt rip, LoRa-enabled sensors transmit a signal to the belt control, shutting the belt down immediately to halt the hazardous and expensive rip from worsening. Mine operators can then inspect the damage and decide how best to repair the system. Additional sensors are placed on belt idlers to measure temperature of the idler bearing as sensors report temperature data to allow mine operators to monitor bearing status to prevent overheating and fires. 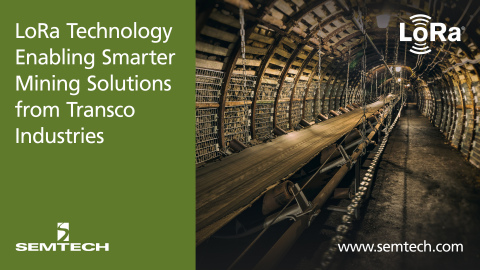 Transco’s LoRa-based conveyer belt application is used in collaboration with Polysense Technologies Inc., an innovative leader in enterprise Internet of Things (IoT) solutions for fiber and wireless sensing. Founded in 1961 as a mill service company in the Northwest, Transco has since grown to become a leader in conveyor technology, component supply, installation, maintenance and repair. Transco is also a steel fabrication, water technologies and industrial design company. Transco’s 100,000 square foot AISC-Certified Portland, Oregon Manufacturing Center includes complete fabrication, sandblasting and painting facilities. Visit their site to learn more: http://www.transco-ind.com/. Located in Santa Clara, California, with offices in Beijing, Luo Yang and Shanghai, China, Polysense develops IoT products and solutions for smart enterprise, city and home, including distributed fiber sensing, LPWAN LoRa, NB-IoT/LTE CAT M and Wi-Fi/BLE based wireless IoT sensors and Cloud based data management and analytics Cloud platform iView, edge computing platform iEdge, smartphone App iPalm. For more information, visit www.polysense.net. All statements contained herein that are not statements of historical fact, including statements that use the words “expected to,” “developed to,” “designed to,” or other similar words or expressions, that describe Semtech Corporation’s or its management’s future plans, objectives or goals are “forward-looking statements” and are made pursuant to the Safe-Harbor provisions of the Private Securities Litigation Reform Act of 1995, as amended. Such forward-looking statements involve known and unknown risks, uncertainties and other factors that could cause the actual results of Semtech Corporation to be materially different from the historical results and/or from any future results or outcomes expressed or implied by such forward-looking statements. Such factors are further addressed in Semtech Corporation’s annual and quarterly reports, and in other documents or reports, filed with the Securities and Exchange Commission (www.sec.gov) including, without limitation, information under the captions “Management’s Discussion and Analysis of Financial Condition and Results of Operations” and “Risk Factors.” Semtech Corporation assumes no obligation to update any forward-looking statements in order to reflect events or circumstances that may arise after the date of this release, except as required by law.